From the road skirting its property line, a former junkyard east of downtown Augusta appears uninhabitable, overwhelmed by years of unlawful dumping of auto parts, oils and solvents. But where salvagers used to sort through smelting piles and debris near the site of an old conveyor belt, Savannah Riverkeeper Tonya Bonitatibus envisions a 14-acre nature retreat. 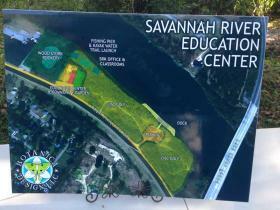 On Thursday, her team of conservationists announced plans to launch a capital campaign to build a $2.3 million Savannah River Recreation and Education Center on city land leased to Bonitatibus’ organization for 99 years. Besides upgraded office space from the 560 square feet it shares now on Riverfront Drive, plans for the project include a full disc golf course, nature trails, kayak launch, sandy beach area and fishing pier. There will also be a wildlife education center featuring a 6,000-gallon aquarium that will hold native fish from the Savannah River, and a laboratory where local conservationists can test samples. Community classes will be offered on topics such as clean-water stewardship, wildlife conservation, hunter education and fishing techniques. Developing the future site will take at least five years and Bonitatibus said the Savannah Riverkeeper will rely on grant funding and private donations to cover project costs. She said her team is working with the Environmental Protection Agency to get approval for cleanup assistance for the site, which will cost an estimated $4 million and is expected to begin in one to two years under the supervision of Riverkeeper staff. “We have some property, which is relatively clean, and then we have 12 acres, which unfortunately is quite contaminated,” Bonitatibus said. Construction of the nature center can begin before cleanup is completed, she said, adding that she hopes the center can serve as a Savannah River museum, with interactive kiosks on subjects including the history of Augusta and the Creek Indian nation. She said her team also intends to use the site to expand its canine training program, which trains dogs to locate underground sewage leaks and toxic discharges. The organization has hired a fifth staff member, Communications Director Elena Fodera, to assist with capital campaign initiatives. Bonitatibus and Riverkeeper board members also enlisted the help of Rocky Evans, the former president of Quail Unlimited.